We are hoarse and hard of hearing, but very happy here at Steingruebl World Enterprises. We'd reserved our Friday night sitter for this evening in honor of my birthday this weekend and then Andy heard from a friend at work that free Sharks playoff tickets were to be had. Well, okay, sign us up! It is not my fault that I look a bit deranged when I'm exceedingly happy and excited. As it happens, these weren't just any old seats, they were Row 1. 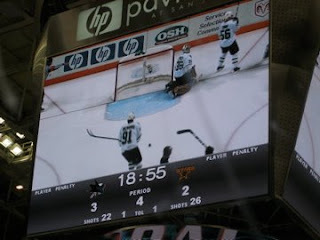 We had to look between the players' legs to see the puck hit the ice in the face-offs. 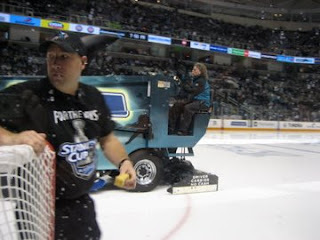 Of course, this meant that we didn't have the best view of the ice, but we did get to smack the glass and get ice on us during some of the bigger hits. I also had an immature but fabulous time thumbing my nose at Turco and any of the other Stars that happened to look my way. It was so fun! And, because the first several rows are seated on top of bleachers, we could stomp our feet to make noise, in addition to clapping and screaming. We could also see that the Comerica Bank Zamboni had something funny written on the side-click to embiggen and you may giggle too. Note how spotty looking the dude with the goal is. That's from smudges on the glass left by actual hockey players. Most of the action seemed to happen at the other end of the ice, but we did get to watch Brian Campbell, with his unbelievably red hair, make a fantastic goal. Given how few shots on goal there were, I think that they must have been pursuing a strategy of boring Turco into sloppiness. But Campbell's shot was excellent and it was right in front of my nose. I'm new enough to hockey that I am not familiar with how the officiating changes with playoff games. It seems like a lot of penalties are not called, and some are random. The Sharks got the best breaks ever (after getting a lot of kinda crummy calls, in my opinion) tonight, with two apparent goals by Dallas being overturned on review. When the Sharks managed to get an icing call on them in the last 5.7 seconds of the 3rd period, I thought we were done for, but they saved themselves and went on to Period 4. For those of you who might have been following this series, you know that this was a decidedly bad thing. We've lost two games to Dallas in overtime here in the playoffs. And then Joe Pavelski just smacked one in and I thought the roof was going to fly off. I know I did my best to help that happen. Good grief. 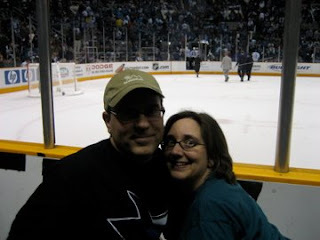 We went in half expecting to witness the Sharks in their last game of the season, and instead we were part of a fantastic party. And, thanks to our corporate sponsors, it only cost us for the babysitter. Dinner and tickets were free! Wow, was that ever fun. Pretty fantastic birthday present from my hubby. 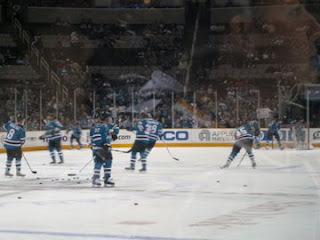 And from the Sharks. Jaya has hit the nail on the head. I don't even consider scores valid if no one had to skate around an octopus or two. Go Wings!